RIPON, Wisconsin — An assistant professor at a Wisconsin college is getting national attention for the research she just published about a dog's empathy for its owner. The idea came to Ripon College's Julia Meyers-Manor when her collie tried to save her mom from a pile of pillows when she was just playing with her children. In her study, Meyers-Manor observed whether dogs would open a door if their "trapped" owner was on the other side crying or humming, and if so, how much of an effort they would make to "rescue" the person. She also recorded the dogs' heart rate variability. Meyers-Manor said dogs can "feel" your emotions. One dog named Molly rammed through the door and leaped into her owner's arms. "If we're distressed they become distressed," Meyers-Manor said. The animals, however, had a hard time deciphering whether the human was being truthful. "In the crying condition the dogs basically ran in, and if they did, they did it within 20 seconds," said the assistant professor. About 50 percent of the dogs rammed through the door. Meyers-Manor said the other half did not because they were too stressed over what they saw and heard. "Dogs were pacing, whining, showing all types of stress behaviors by their owner's distress," said Meyers-Manor. "So they start to shut down and freeze from opening the door." 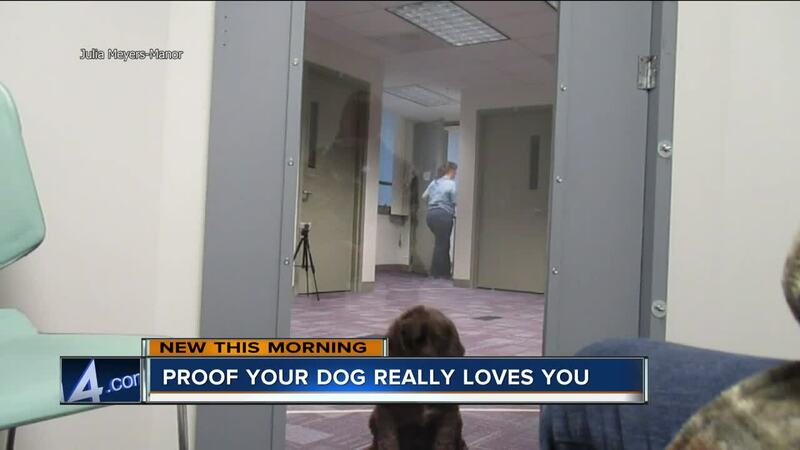 To many people's surprise, she found service K-9's in the study performed no different than any other pooch. None of the more than 30 animals were hurt in this study. You can read the assistant professor's published research by clicking here .